INSTALL Labor-Management collaborations excelled in 2018, effectively growing market share, recruitment and training. Thanks to the hard work and UBC staff and INSTALL contractors, 2018 was a great year. 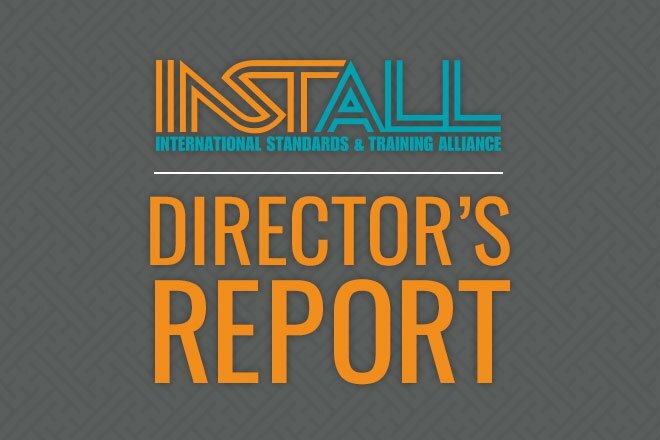 We’ve raised INSTALL’s standing in the floorcovering industry and are now recognized as providing the most highly skilled, professional and best trained installation teams in the industry. Each day, we continue to work towards accomplishing the UBC’s goal of acquiring 70% market share. We will work with more INSTALL contractors, enabling them to join in the Expansion Program‘s efforts to pursue new work in the southern and western regions of the United States. We will expand our efforts in developing the floorcovering industry’s leading standards in concrete polishing training and eventual certification. INSTALL and participating partners in this market made great strides towards these overarching goals last year, and I believe that our efforts in 2019 will continue this trend. The Carpenters International Training Fund (CITF) is hosting an upcoming curriculum review in March and April. They will gather all of the prominent subject matter experts from across this sector to review. Upon completion, INSTALL will have the only recognized and industry-endorsed training on polished concrete flooring solutions. Training sessions on concrete polishing are currently being held every month in the Eastern District and there are plans to expand this training across the UBC in 2019. The UBC’s Infection Control Risk Assessment (ICRA) saves lives! INSTALL certification standards have also been adopted by the U.S. Department of Veterans Affairs (USDVA) master specification. In partnership with the Midwestern ICRA Committee, we are now lobbying the USDVA to specify UBC ICRA certifications. Once approved, every UBC member and contractor can benefit from having work in this market segment directed to them. Throughout 2019, INSTALL Forums will be held the last Thursday of each month, at 4:00 pm EST. Currently, there are subcommittees working on best practices for recruitment, next generation leadership and skills enhancement training. These Labor-Management (LM) subcommittees, chaired by Rich Williamson (MRCC), Kyle Smith (IKORCC) and Jim Barr (NERCC), respectively, are dedicated to these initiatives and welcome new ideas and participation. Previous efforts have shown that INSTALL Labor-Management collaboration is a proven winner and all members are urged to participate. We will only get to 70% market share and accomplish our other goals this year by working together. INSTALL – delivering work that we ALL can take pride in!